DETAILS: 29 Beachcomber Lane is a beautifully decorated, two story beach cottage located in the fabulous community of Seacrest Beach! This charming 3 bedroom/ 2.5 bathroom home comfortably accommodates ten guests. The first floor screened in porch will be a favorite among family members looking for a good place to relax and enjoy the outdoors. Once guests are settled in, step off the porch and onto the green way that leads to the 12,000 square foot lagoon community pool. 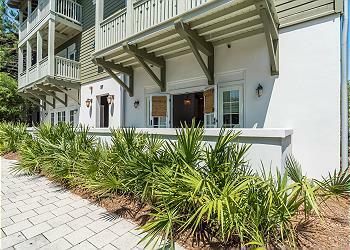 Hop on the bikes provided to explore Rosemary Beach or the beautiful emerald water of the Gulf of Mexico. 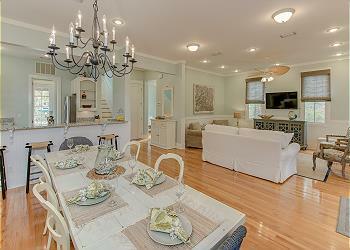 Check availability and book this fabulous home today! 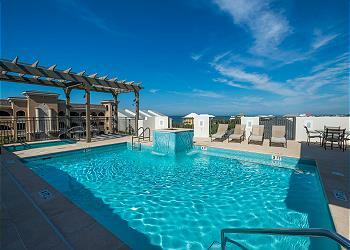 AMENITIES INCLUDE: 3 adult bikes provided, community pool, screened porch. This property comes with 2 dedicated parking spots. Complete Clean Linen Participant - ALL linens, including comforters laundered upon every checkout. Very nice property with convenient location. Everything was as advertised. Would definitely stay there again. We are so glad that you enjoyed your stay with us in Seacrest Beach! Thank you for staying with 360 Blue, we look forward to seeing you again soon! We are so delighted that you enjoyed your vacation with us in Seacrest Beach! We agree that this home is a great option for a fun-filled beach getaway and we especially loved the photo you shared! Thank you for staying with 360 Blue, we look forward to seeing you again soon! We absolutely loved the house! Very pretty and comfortable! Loved the community services offered and having the tram service to access the beach was awesome! We are so delighted that you enjoyed your vacation with us in Seacrest Beach! We agree that this community is wonderful for a fun and relaxing beach getaway! The photo you shared is breathtaking! We hope to see you again soon! The weather was not good but the house was great and pool was amazing! Kids and adults both loved it! We are so thrilled that you all enjoyed your stay with us in Seacrest! We especially loved the adorable photo you shared with us! We hope to be able to host you all again and this time with better weather! This home is beautiful! We absolutely enjoyed our stay the home has everything you could need and is spotless! Highly recommend! We are so delighted that you enjoyed your stay with us in Seacrest Beach! Thank you for staying with 360 Blue, we hope to see you again very soon! This was our second time staying in Seacrest and full in love with it even more this time. Our house was perfect! Ww will definitely be back to visit soon!! What a beautiful photo!! We are thrilled you had such a wonderful stay in Seacrest Beach! Thank you so much for staying with 360 Blue and we can't wait to have you back at the beach again soon! This was our first stay in Seacrest and we could not have been more pleased with the accommodations. An extremely well designed and decorated unit with attention to detail. The furnishings are comfortable and stylish. We celebrated our 10 year wedding anniversary as well as attended a nephew’s wedding. We were sad to leave, but look forward to booking this unit again. Congratulations on 10 years of wedded bliss! We are honored that you choose 360 Blue for such a special occasion. We loved having you with us and look forward to seeing you back soon! First Experience tenting w/ 360 Blue. We have used close to 12 others in the past, same location (30A). Our favorite rental co yet. No issues, house was in excellent condition. Never needed to contact them everything was perfect. We are so appreciative of your kind words! We take our customer service level very seriously, so to hear a review like this from one of our guests is the greatest compliment. We are thrilled that you found the home to be in excellent condition, and please don’t ever hesitate to contact us if you need anything at all during one of your future stays! We can’t wait to help you plan your next perfect vacation. Thanks so much again for the wonderful review! Absolutely beautiful house. Plenty big for our family of five plus grandparents. House is in the back of the neighborhood but it’s only about a five minute walk to the beach. They beach trams are very quick to pick up if preferred and the drivers are very nice. The bikes were a nice added feature and we would ride them once a day to neighboring Alys Beach and Rosemary Beach. This house was very clean and the kitchen well stocked. Love the clean linen program 360 blue participates in where even the duvet cover is washed. Great porches on both levels. Felt safe with security driving around neighborhood regularly. No complaints at all. We had a great vacation and can’t wait to come back. What a fun photo! It looks like you go to enjoy some perfect beach weather on our beautiful white sand beaches! We are delighted to hear you had such a great stay with us! The beach tram really does make getting to the beach so convenient! Thank you for choosing 360 Blue for your family's beach vacation. We hope to see you back again soon! Wonderful house. Plenty of room for 2 families. Perfect location too. Hope to be back soon. What a beautiful photo! You truly captured the beauty of our 30A sunsets! We are so pleased that you enjoyed the property and your stay with us so much. Thank you for choosing 360 Blue for your beach escape! We hope you'll be back to visit us again soon! We had a great time! The house is beautiful and we had no problems. If only the weather was a little better:( loved the live music up front and little shops. The bikes were great for getting to other little towns. The tram was located right out front to take us to beach. Any questions we had were answered very promptly. Great family vacation. Such a beautiful family photo! We are thrilled you had such a wonderful vacation in Seacrest! The home truly is great and the tram is so convenient :) Thank you so much for choosing to stay with 360 Blue and we can't wait to have you back at the beach again soon! Our family of 5 had such a great vacation at Seacrest Beach. This house was amazing...very clean and comfortable. The porches were one of our favorite parts-the screened in porch downstairs and the bed swing on the balcony upstairs! We had everything there that we needed. Of all the houses that we have rented at Seacrest, this was our favorite and we will definitely rent this one next year! And, 360 Blue is awesome! Thank you so much for taking a moment to share your experience with us! We are absolutely delighted that you enjoyed your stay so much! We're glad you could take advantage of some relaxation time on the porches! Thank you so much for choosing 360 Blue for your beach vacation, we look forward to helping you plan your next stay with us! We had a great time! We absolutely loved our house! What a beautiful photo! We couldn't be more happy you had such a wonderful spring vacation! Thank you for staying with 360 Blue and be sure to visit us again soon! We loved staying here! The house is completely stocked with great quality items for cooking and comfort. The location is perfect. We can't wait to return. Such a beautiful family photo and looks like the perfect day at the beach! We are so happy you had such a wonderful time and thank you for staying with 360 Blue! Be sure to visit us again soon! Great fun, great family, great food and a great 55th wedding anniversary. Plus a superior facility. Thank you. Congratulations! We are so honored that you chose to spend such a special occasion with us. We hope to have you all back soon! What a beautiful home!!! Immaculate kitchen and very comfortable beds. We will definitely be coming back to this house next summer!!! I loved the screened porch and the private woodsy setting of the back yard. Great place to sit and sip my coffee in the mornings. Also loved that the pool was literally just a few steps away. Perfect vacation for my family!! Such a beautiful view. We are so happy that your family had such a wonderful time in this home for your beach getaway. We love that porch just as much as you do and the views are stunning. We hope to have you all back soon! What a great photo! We are thrilled that you had such a great time and look forward to seeing you for many more years! Loved the house! Perfect for our 6 family members. Perfect location, comfortable home- amazing vacation! The house was amazing. The kids enjoyed the pool and the short wall to the beach was perfect.